Lesson planning doesn't need to be difficult. 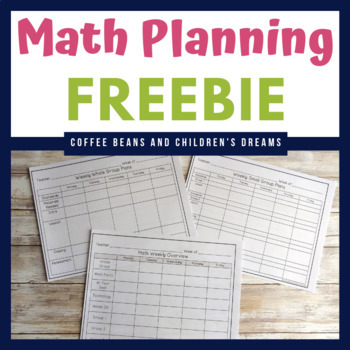 This set of lesson planning templates are perfect for your math block that includes small group instruction. I have included a weekly overview page and several different ways to plan whether you need weekly, or daily I have you covered. Weekly Overview - perfect for team meeting where you are tentatively planning your week. •	Please go to your My Purchases page (you may need to login). Beside each purchase you'll see a Provide Feedback button. Click the button to go to the page where you can rate the product and leave a comment. Each time you give feedback for a paid product, TPT gives you credit for money of future purchases. I value your feedback, it helps me determine which products are the most important to you which allows me to create more products to meet your needs. Be the first to know about my new discounts, freebies and product launches. Click here to become a follower and be the first to here about new products. All new products are 50% off the first 48 hours, so it pays to follow me.